This is a very common form of osteoarthritis affecting the hand and is also known as Basal Joint Arthritis. It usually occurs when the cushioning cartilage wears off from the adjoining ends of the bones that form one's thumb joint. One may experience severe hand pain, swelling, decreased strength and motion making it tough to do simple household chores such as opening jars. 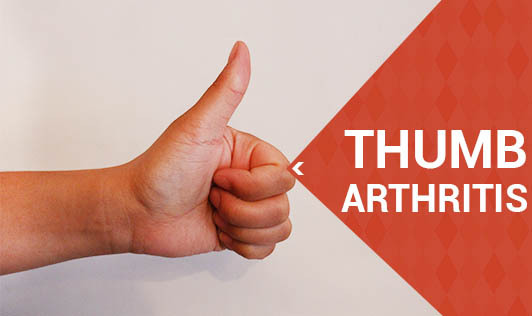 What are the symptoms of Thumb arthritis? • Pain occurring at the base of the thumb when one pinches or grasps an object between the thumb and forefinger. • Improve your joint mobility by performing a range of motion exercises. • Avoid hand clenching when you carry things by choosing a purse with a sturdy shoulder strap instead of grocery bags with handles. • Your doctor may recommend using heat or cold packs to help relieve swelling and pain. If you have severe pain, stiffness or swelling at the base of your thumb, please seek medical assistance for an evaluation!